The technological processes involved in unconventional oil and gas extraction, which include hydraulic fracturing (‘fracking’) are complex, so there’s plenty of scope within the media for misinformation and hair-splitting. This is my attempt to untangle some of the strands of the argument currently shrouding Cuadrilla Resources’ exploratory drilling at Balcombe in Sussex, and to tease out the bigger picture of why this is happening. 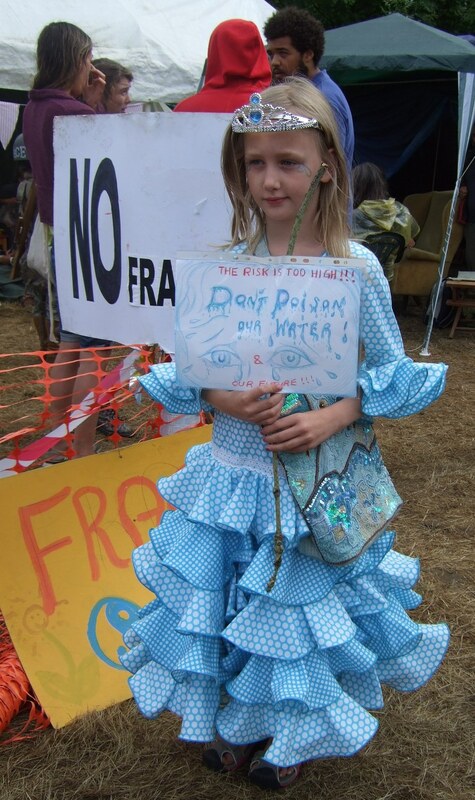 Choosing to abandon plans for a walking holiday, a friend and I – both members of Frack Free Somerset – spent five days living at the ‘Balcombe Community Protection Camp’, arriving on day 6 of the protest, which included local families, the elderly and eco-activists from near and far. During that time and subsequently, I’ve repeatedly witnessed how media reporting of the issues at Balcombe has reiterated a story that really there’s nothing new happening in this small roadside field in rural Sussex – an exploratory oil well was first drilled in 1986, and surely Cuadrilla’s activities are no different? What covertly emerges from this opening extract of a longer article is that fracking is almost a figment of campaigners’ fearful imaginations. Typically, the article continues with the sensational news of a few arrests – nothing about the peaceful and intensely creative nature of the camp, nor of the police repression that I and many other protestors personally witnessed. 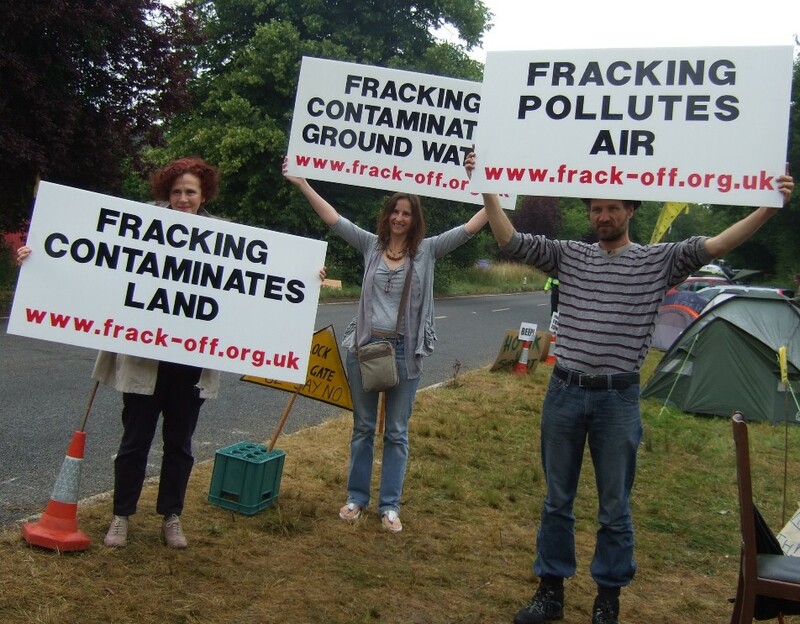 Only towards the end of the article is there space for some elaboration of people’s concerns, with Vanessa Vine from Frack Free Sussex quoted as saying that any future fracking would be “a violation of our geology that could threaten our water, fresh air and our children”. Spokespeople from the No Fracking in Balcombe Society and Friends of the Earth are also quoted, but the article ends with reassurances from Francis Egan, CEO of Cuadrilla, that ‘fresh permission’ would be required to proceed with any fracking. Of course one part of the analysis missing from these and most other reports is why Francis Egan would even be interested in this existing oil well first drilled by Conoco in 1986, then plugged and abandoned after their evaluation? If Conoco couldn’t exploit its resources, how come Cuadrilla is now so keen to proceed? Could the answer just be that Cuadrilla isn’t a conventional oil drilling company, but one of a growing number worldwide that use fracking and horizontal drilling to extract oil and gas trapped in low permeability rock, and that Francis Egan knows full well that the fracking process – which uses hundreds of highly toxic chemicals to fracture rock in order to release the oil or gas that’s being extracted – will be used at Balcombe? Cuadrilla has publicly stated that they will initially ‘stimulate’ the well by injecting hydrochloric acid (a so-called ‘acid frack’), an amount likely to be in the region of 16,000 gallons of pure acid, which will be forced into the ground below the village. 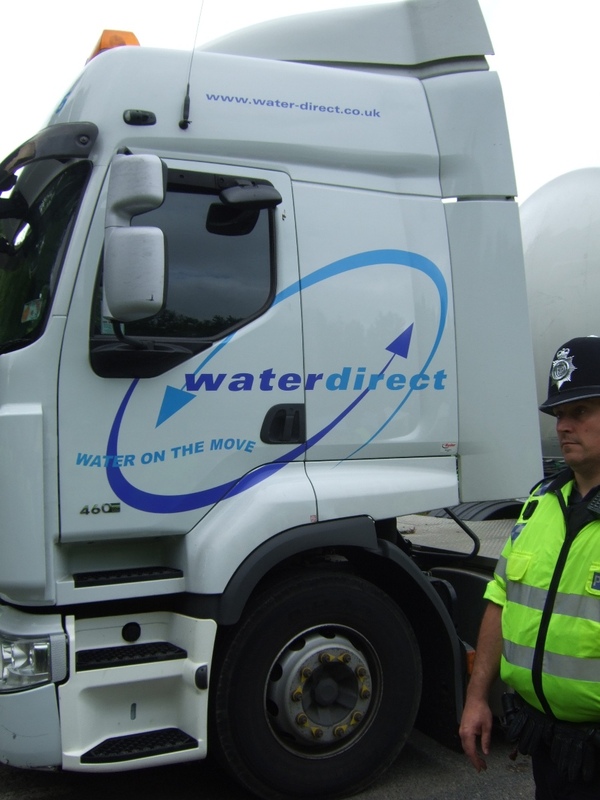 The quantity of water likely to be injected underground totals more than 12m gallons – or around 24 Olympic swimming pools. Despite the huge amounts of energy and resources required for unconventional gas and oil extraction, Egan will have been encouraged in his endeavours by the government’s support, with the Chancellor offering “the most generous tax breaks in the world”, and many ministers, advisers and lobbyists all standing to personally gain from the industry’s development in the UK. George Osborne (whose father-in-law, Lord Howell, has vested interests in fracking) recently declared: “It would be a real tragedy for Britain to allow this energy revolution to bypass our country. It would mean we would have much higher energy costs than other countries, it would mean jobs would go to other countries and we would lose out”. This line about the UK losing out is commonly used by politicians (e.g. in response to calls for greater regulation of the City in the wake of the banking scandals) and tends to be uncritically repeated by the media. Cheaper prices for consumers also provides good political spin, and rarely gets examined. In backing fracking, Osborne is also deliberately ignoring the green energy revolution that he and his supposedly ‘greenest ever’ government could otherwise be supporting, and which a report shows could provide up to a million jobs. Furthermore, much of the government’s excitement about unconventional gas and oil in the UK is based on the experience in the US, where cheaper gas prices have in actual fact come about because of the law of supply and demand – the economic recession has caused a lower demand for energy there, and with the US unable to export its gas (having no pipeline in place) a glut is currently depressing the market. ‘Eco-warriors are delightful, we’re grateful for their help’. ‘The Cole Morton Special Report’ pays lip-service to a couple of concerns about unconventional gas and oil extraction (air pollution and earthquakes), and then systematically knocks them down with the help of a pro-fracking professor, Peter Styles from Keele University, and more from Mr Egan, who presents another industry myth – that unconventional gas and oil extraction offers us a ‘bridging fuel’, “that will buy us time to work out what to do with nuclear power and how to harness the wind and sun without the false economy of subsidies”. ‘The false economy of subsidies?’ Unsurprisingly, Morton doesn’t question Egan’s statement in the light of the Chancellor’s 50% tax breaks for the industry, nor does he mention that Germany is going full steam ahead on renewables, having banned fracking and nuclear; nor is there any plug for Britain’s Centre for Alternative Technology and its blueprint for a Zero Carbon Britain by 2030 – a plan which might just mean that we could meet our carbon reduction targets. 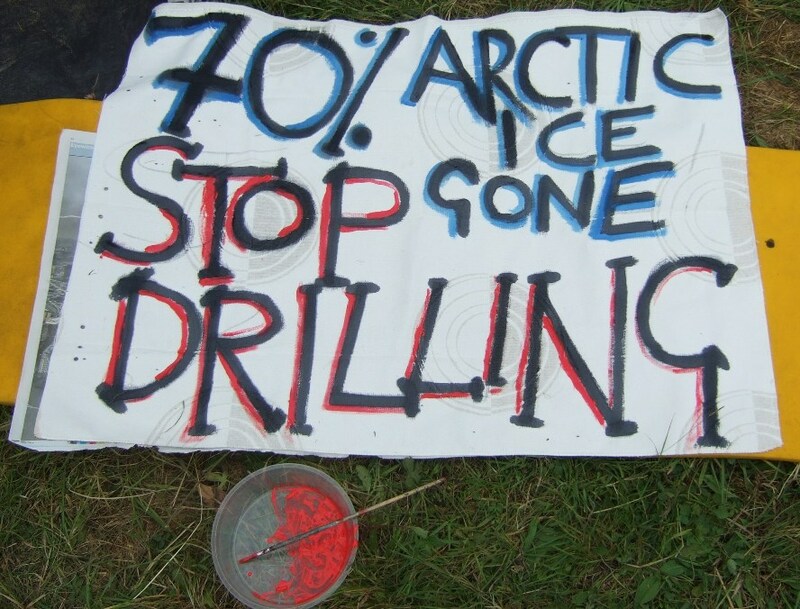 After all, how can drilling for yet more hydrocarbons make any sense given the reality of man-made climate change? Yet this part of the bigger picture has to my knowledge almost entirely been ignored by the media in discussions on fracking – and the degree of climate scepticism in this country additionally makes it hard for anti-fracking protestors to cite climate change as being a valid reason for rejecting unconventional gas and oil extraction. 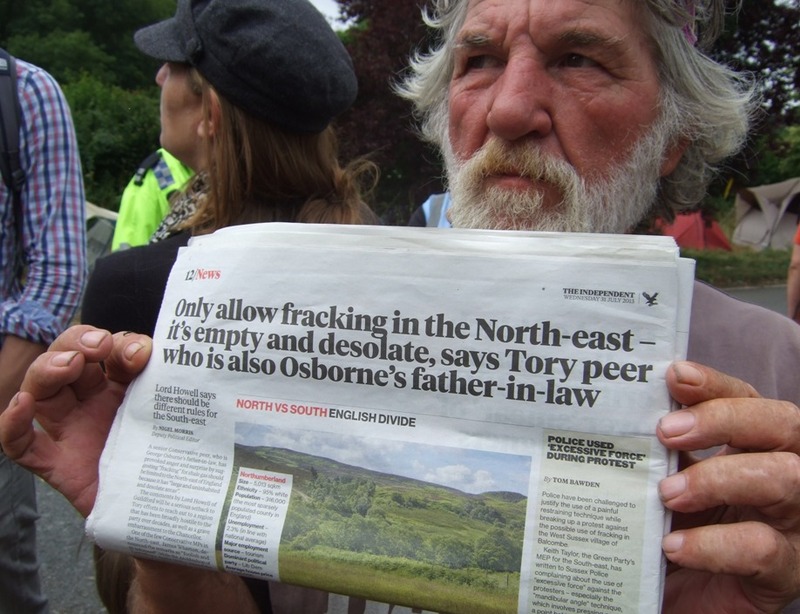 Take note frackers – unconventional gas and oil is that dirty fuel, and communities all around the country are seeing through the corporate propaganda, the government and industry myths and spin. 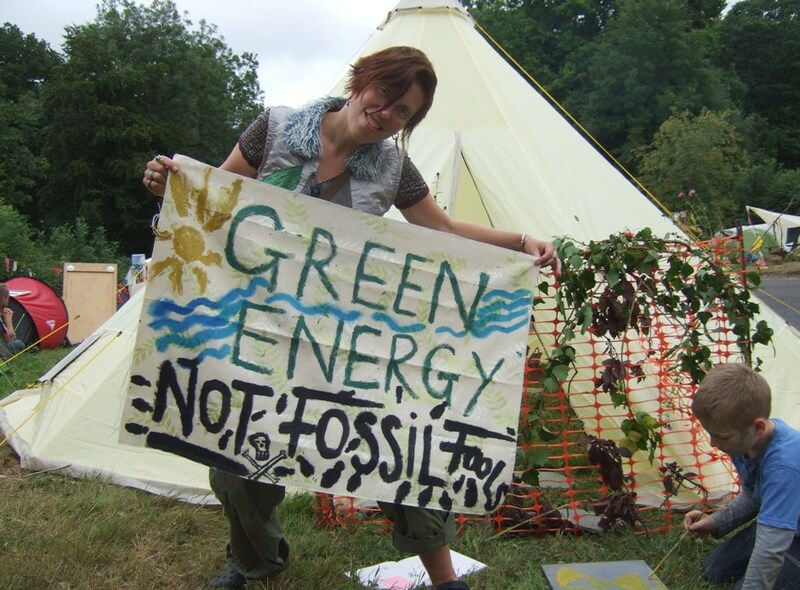 A coalition of civil society organisations in the UK, including the WI, the Church of England and the Campaign for the Protection of Rural England, have joined the Co-op in advocating the development of community energy, along the lines that far-sighted countries such as Denmark and Germany are already developing. Clearly, renewable energy is our only path into an ecologically sustainable future, and the protest at Balcombe, which cuts across the demographic spectrum, will be the first of many if this government continues on its reckless drive towards profit over people and planet. 1. 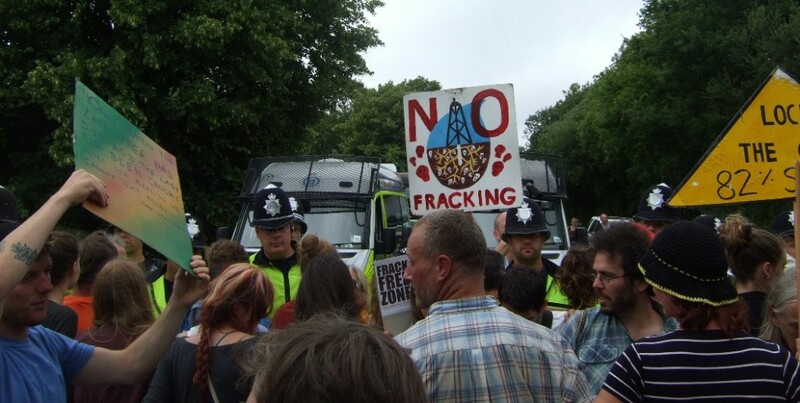 One example of police repression occurred on Friday August 1st, after an old fire engine was used to block the gate to the Cuadrilla site, and held up deliveries all morning while police worked to free protestors who had ‘locked on’. Once the fire engine had been towed away, the police were clearly under instruction to speed things up, and began marching dangerously fast down the road in front of the delivery lorries, at times physically pushing people out of the way, whereas previously the pace had been much slower and had allowed for peaceful protest. This entry was posted on 8 August, 2013 in homepage and tagged Anti-Fracking protests, Balcombe, BBC Sussex, Cuadrilla, Ed Davey, frack free somerset, Frack Free Sussex, fracking, Francis Egan, george osbourne, Helen Moore, Propaganda War Over Fracking, Rupert Murdoch, Sunday Telegraph, The Sun, ucoventional oil and gas extraction, Vanessa Vine. Bookmark the permalink.